I came across another sweet self-hosted Lifestreaming mashup using Friendfeed + Shadowbox.js + Google Charts. This project was created by Wally J Punsapy. You can see a shot of his Lifestream below and read more about this project on his post here. But that’s not all folks. He’s also created a mobile version of his FriendFeed powered Lifestream with some help from Symfony which you can see a screenshot of below. 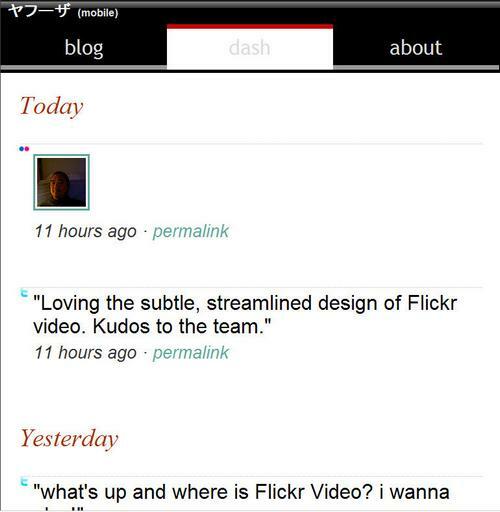 You can view his mobile Lifestream by clicking on the “dash” tab at m.yahooza.com. His post on creating this can be found here. 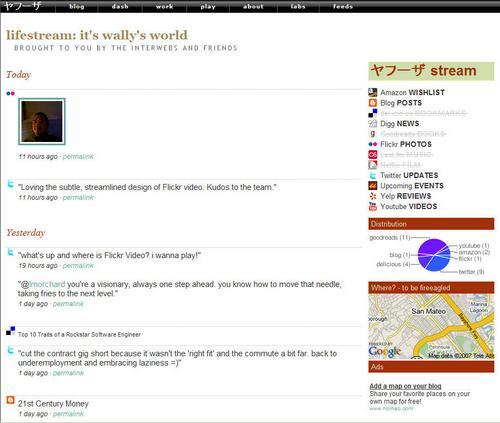 You should go subscribe to Wally on FriendFeed here to track any other cool new projects he’s working on. NB: Yahooza mobile lifestream work only on iPhone.